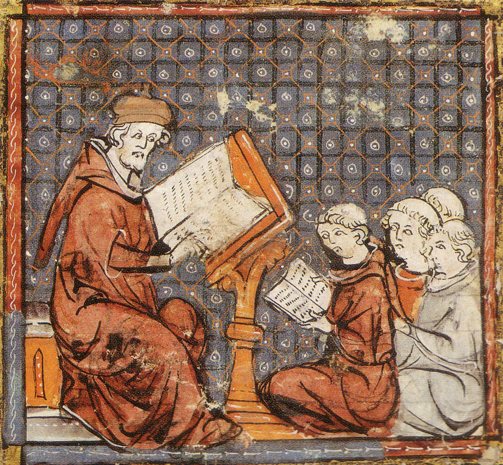 During the Middle Ages, schools were established to teach Latin grammar to the sons of the aristocracy, as part of preparation also for the entry of some into the clergy and religious orders. The church preserved literacy and learning during this period, and education was closely tied to the religious vocation, in order to read the Bible and related documents. The Protestant Reformation had a major influence on education and literacy in England, as it encouraged the reading of the Bible in the vernacular of the people. In the 19th century the Church of England sponsored most formal education until the government established free, compulsory education towards the end of that century. However, unlike the French, who followed a strict policy of secularisation of publicly funded education, a strong voluntary-aided church sector has maintained a strong presence in the British system. The half-baked attempts at comprehensive education in this country were accompanied by the scaling back of grammar schools and religious schools during the middle of the twentieth century. That comprehensive schools were never as good as they could and should have been was partly down to them being undermined by the continued existence of grammar, church and independent schools, alongside the usual resourcing and training issues. But what we have seen with the establishment of the Thatcher/Blair/Cameron Tory hegemony of the last 35 years is non-sequitur thinking that the way forward in education is to go backwards. Thus the support for an ever-increasing diversity of ideologically driven schools, often overtly religious and fundamentalist in character. Organisations such as the British Humanist Association (BHA) have done crucial work in attempting to ensure some balance, and especially in terms of getting non-relgious world views considered alongside the religious. But this is now under direct threat and and we are seeing disturbing trends in the very essence of education in this country. The All Party Parliamentary Group (APPG) on RE, led by Conservative MPs Fiona Bruce and David Burrowes, has voted to remove the study of non-religious worldviews from its purpose. Since its foundation, the purpose of the group has been ‘To provide a medium through which parliamentarians and organisations with an interest in religious education can discuss the current provision of religious education, press for continuous improvement, promote public understanding and advocate rigorous education for every young person in religious and non-religious world views.’ This has now been amended to remove ‘and non-religious’. The British Humanist Association (BHA) has expressed its shock at the decision. In addition, the Religious Education Council of England and Wales (REC), which until a few months ago provided the secretariat for the group, and National Association of Teachers of RE (NATRE), have both expressed their disappointment. With aspects of science, such as evolution, undermined in some of the Government’s academy schools, and blatant disregard of attempts to control illegal teaching of it until some had to be forcibly closed, it may have been hoped that things war improving. But it is far from being so. Newsnight, earlier this year, found that a number of illegal strictly orthodox Charedi Jewish schools in North London are, not only carrying on regardless of the law, but have been granted charitable status. Only pressure from the BHA is seeing this situation finally be investigated. As I have said repeatedly before, the existence of extreme sects of any religion is only possible as offshoots of a main body. This means the pressures for schools to serve these extreme sects can only grow in some sort of proportion with the number of supposed mainstream church schools. The news that the Church of England is seeking too open more than a hundred new schools by 2020, as part of the Free Schools programme that gave rise to the creationist and Charedi problems, is therefore cause for great concern. This concern should be heightened by the the Church being remarkably open about its motivations. In the face of declining church attendance and diminishing proportions of adherents in their schools, they are now openly stating that the evangelising of children must be engaged with ‘a new sense of urgency’, a view echoed by the Catholic Church and cross-denominational groups. Given this impending assault, aided and abetted by the Christian Right in parliament, we are very much in danger of seeing the hideous sort of politics we currently see purveyed by the Christian Right in the USA becoming more prevalent here. Scary stuff. God help us? If only!! One last point – if you want to help counter this growing tide of religiosity in our schools, you might like to consider supporting the BHA’s “What is Humanism?” Book Appeal. The appeal aims to send a copy of the an important new book aimed at helping primary school children have some perspective on some big questions. What does it mean to be a humanist? Is humanism a new idea? How do people live their lives without religious beliefs? The first of its kind aimed at a new curriculum for upper primary and lower secondary school children, this book will examine how humanists respond to fundamental questions about morals and ethics, the origins of life, religion and the state. It will look at how humanists mark the milestones of birth, marriage and death. How do people without belief in God live moral and fulfilled lives, with respect for humankind and the universe? A thought-provoking approach will encourage readers to think about the big questions for themselves. The book includes contributions from a number of prominent humanists, such as Stephen Fry, Camila Batmanghelidjh, Philip Pullman, Jim Al-Khalili, Natalie Haynes and Shappi Khorsandi, who will explain their own philosophy and tell us what is important to them. Every home should have a copy! This entry was posted in Uncategorized on September 6, 2016 by Bridgend's Green Leftie.